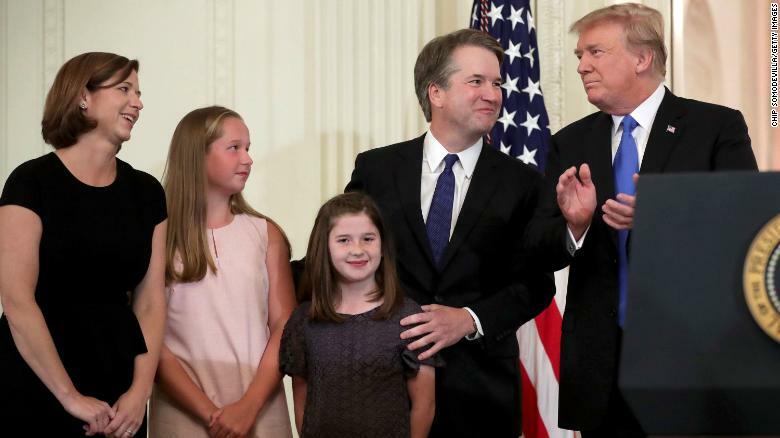 Washington – President Donald Trump apologized to Supreme Court Justice Brett Kavanaugh for “the terrible pain and suffering” he and his family were “forced to endure” during his confirmation process, at a ceremonial swearing-in event at the White House on Monday evening. “Those who step forward to serve our country deserve a fair and dignified evaluation, not a campaign of political and personal destruction based on lies and deception,” Trump said. “What happened to the Kavanaugh family violates every notion of fairness, decency and due process,” the President continued. “You, sir, under historic scrutiny, were proven innocent,” Trump said to Kavanaugh. The FBI probe into the allegations against Kavanaugh reportedly found no corroboration of the allegations against him but was criticized by Democrats for not being a full investigation. The ceremony took place in the East Room — the same location where the President first announced Kavanaugh’s nomination 13 weeks ago. Kavanaugh was confirmed by the Senate on Saturday, earning 50 “yes” votes — the fewest for any Supreme Court justice in the modern era. The process was marred accusations of sexual assault and misconduct dredged up weeks before senators cast their votes. He denied all the allegations. Earlier Monday, Trump claimed the accusations against Kavanaugh were a “hoax set up by the Democrats.” He also blamed “evil” people for putting Kavanaugh in a “disgraceful situation” during his confirmation process. The President had at one point previously been conciliatory toward Christine Blasey Ford, who testified before Congress alleging that Kavanaugh sexually assaulted her. Trump, at the time of the testimony, called Ford a “good witness” and said he respected her position very much. Kavanaugh was administered the official Constitutional Oath and Judicial Oath by Chief Justice John Roberts and retired Justice Anthony Kennedy shortly after being confirmed by the Senate. The latest justice to join the bench, Neil Gorsuch, spoke last year during his swearing-in at the White House Rose Garden. Justice Samuel Alito spoke at his swearing-in as well. However, Justices Sonia Sotomayor and Elena Kagan did not offer remarks during their respective swearing-in ceremonies, opting, instead, to speak at receptions with then-President Barack Obama regarding their appointments.